The Aprilia RST 1000 Futura has almost everything you need to run electrical goodies like sat nav, heated grips or whatever you want. But if you’re planning on running accessories, you need to make sure the charging issues are dealt with first. That means doing the wiring mod and having a charge rate of at least 14 volts at 4,000rpm. Many standard Futuras only make enough power to keep the battery charged, so you need to do this before you try and run anything else – that goes for alarms, too. For more information, see the Wiring Mod page. Once your charging rate is up to scratch, you’re good to go. To the right of the dash, you’ll see a ring stamped in the grey plastic – that’s where your power socket can go. The Futura also comes supplied with an electrical accessory connector already in the wiring loom. The connector is fused already. 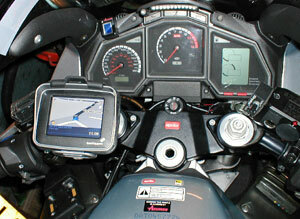 On some bikes it’s staring right at you when you remove the dash panel. On others you’ll find the connector, a white female-type on the end of blue and orange wires, clipped to the back of the instrument panel, which means unbolting it first. In other cases it is tie-wrapped to the main loom as it runs down the right spar. Just snip the two tie wraps and the connector comes free, along with plenty of spare wire. You then just need to get an accessory connector to plug in the connector on the bike, and drill out the mounting point and the job’s done. It’s worth pointing out that if you do it this way, the plug will be permanently on, regardless of whether the bike’s ignition is on. This could be a problem if you’re using heated grips and forget to switch them off when you park the bike. It can be fixed if you know what you’re doing with electrics. 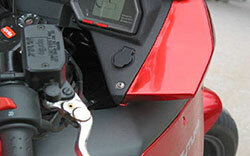 Some riders point out that if you use the blank from the dash panel, the wires from any device you connect could foul the handlebars. If this worries you, there is enough wire on the connector to fit an accessory plug lower down the fairing, keeping trailing wires away from the bars. There are any number of connectors you can fit here, but among US riders the Powerlet socket is a favourite. And if you’re wondering just how many accessories you can run at a time, Powerlet do a guide that helps you work it out, just click on the “EEC” tab.